It’s finally spring: the leaves are beginning to bud, the flowers are blossoming, the grass is turning green—the cold days are over at last! If you are one of those who love to appreciate the colors of spring or if you enjoy reading a good book by the window, with the warm sunlight touching your cheeks, you will definitely love this home improvement suggestion. Renewal by Andersen® of St. Louis, the leading Chesterfield, Missouri, windows company, recommends investing in a bay or bow window. Either of these window styles is definitely going to be a great addition to your home, as both can significantly enhance your home’s appearance on the outside and on the inside. Yes, these windows can actually do this without any major renovations to your home. What’s more amazing is that these window styles allow you to put together your own comfortable sitting nook just by the windows. Bay and bow windows are made up of three to four window panels, with the windows at the sides placed at an angle. These windows jut out of the exterior walls of your home, providing extra space that could be turned into a cozy area, with great seats, a small table, and even houseplants. To top it all off, because bay and bow windows have wide glass panels, they can also flood your room with natural light while providing everyone in your home a beautiful, scenic view of your surroundings. If you are interested in enjoying the advantages of having bow or bay windows in your home, you can call the most trusted windows contractor in Chesterfield, MO, Renewal by Andersen of St. Louis. We also offer other window styles you might equally enjoy. Just browse through our website to learn more about our products and services. We also serve the following areas: Florissant, O’Fallon, and St. Charles. 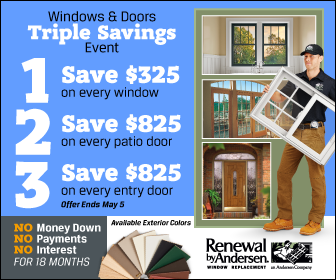 Call now and feel the difference Renewal by Andersen of St. Louis makes.